There’s something swimming in the water and it wants to have fun! It’s not just a shark. It’s a whole SHARK PARTY! Summer is all about having days off, going on vacations, and jumping in your nearest swimming pool. 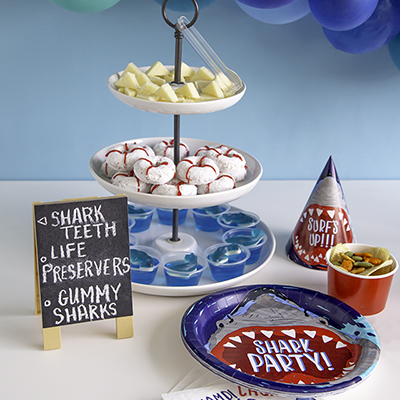 It’s almost August, so why not take advantage of this warmer weather and throw a big party… with sharks! Everyone’s fascinated by these creatures of the deep – so much that there’s an entire week dedicated to them on TV! Sure, sharks can be scary, but we promise our Shark party ideas will have everybody shaking their dorsal fins. Drop some towels in a basket, fill a pitcher to the brim with your favorite ice cold drink, and make sure you’re in your swim suit! 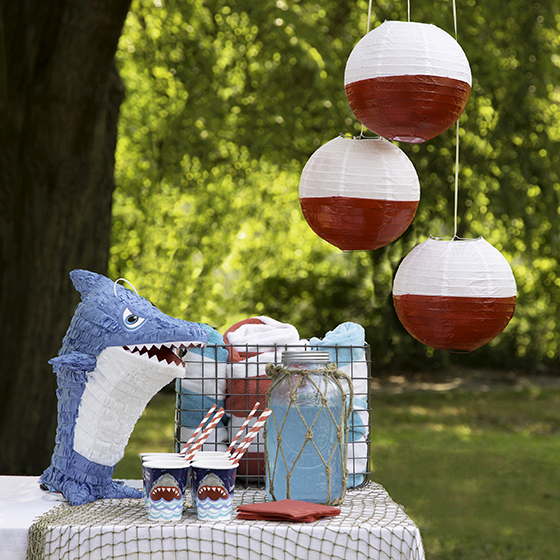 It was easy to create the perfect poolside party table to fit this shark party theme. First, we laid down some fishing net over a plain white tablecloth to create a scene that any sea skipper would enjoy. Then, we poured some blue punch into a big glass drink dispenser. Naturally, the Shark Party Cups – complete with paper straws (a current trend, if you read the news) – went right along with it. Lastly, we made fishing bobber hanging decorations to hang from a tree. All you need for this DIY craft are a few White Paper Lanterns, painting or masking tape, and red spray paint. Kids can play fun games like Swim Fishy Swim, where two players wait in the water, and when they say “SWIM FISHY SWIM!”, the other players have to swim from one side of the pool to the other without being caught! Throw some pennies to the bottom of the pool and see who can retrieve the most. The winner gets a prize! The best shark party activity, however, is our Shark Pinata! Fill it with treats, then line everyone up to pull the strings until the candy comes out. Our Shark Goodie Bags are great for holding all the fallen loot! Invite everyone inside after they’ve dried themselves off so they can grab a BITE! 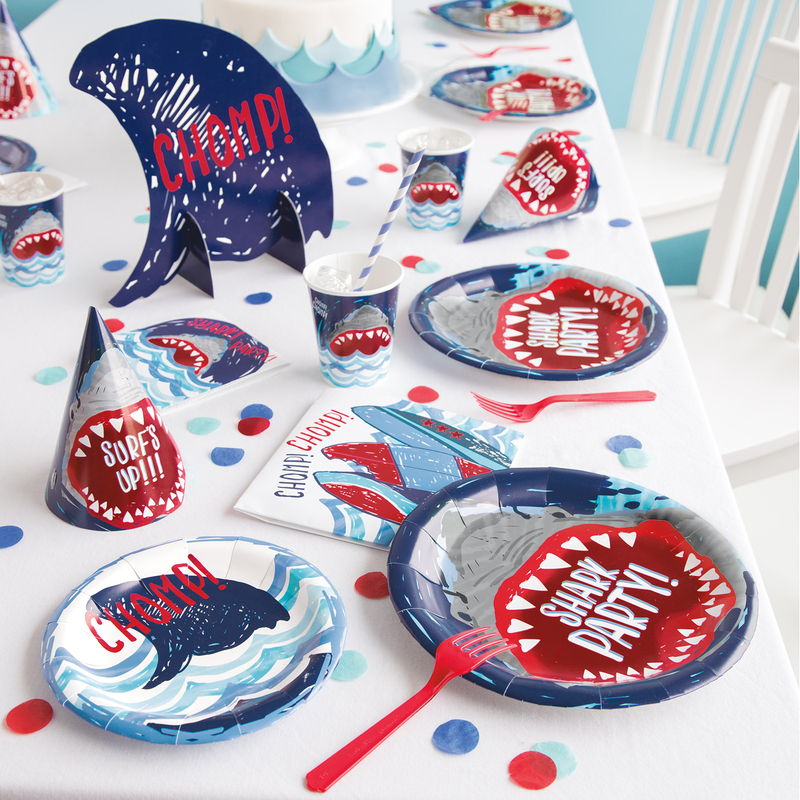 Our Shark party tableware and decorations are guaranteed to take the table from drab to JAWS-ome. We went all out and made a balloon bunting for the wall. With a combination of blue balloons in varying shades and sizes, we just had to tape them together to make a show-stopping display. 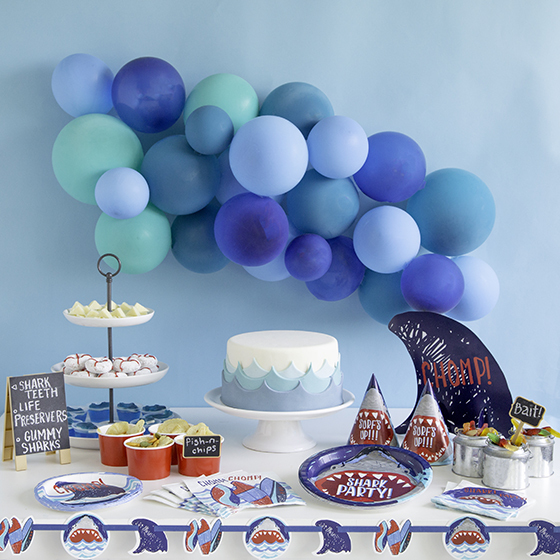 Our Shark Party Centerpiece also makes an excellent addition, and a set of Shark Party Hats is sure to get snatched up as soon as everyone arrives. Lots of swimming sure can work up an appetite, so it’s a great idea to have a full spread of fish food for guests to sink their teeth into. 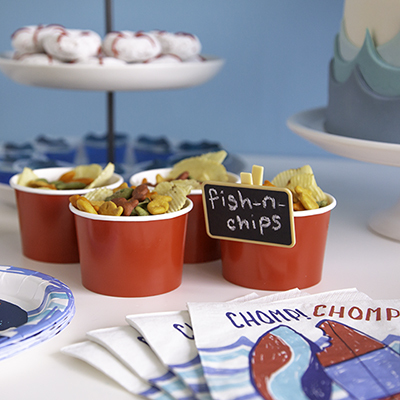 We stocked our snack table with all kinds of shark themed snacks like fish and chips (goldfish crackers and potato chips), shark bait (gummy worms), and a big wave cake! Did you know that squeezing a little icing on a powdered donut makes it look just like a life preserver? Or, that you can turn your favorite cheese into shark teeth by cutting it into tiny triangles? Just keep a set of mini plastic tongs nearby to help pick them up! 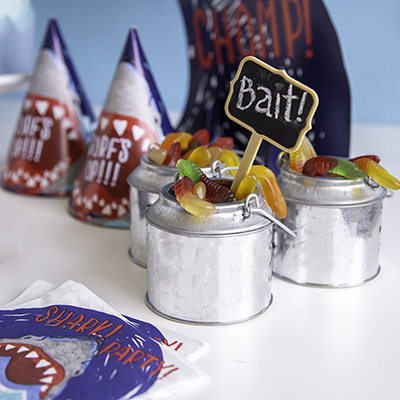 Another fan favorite is little cups of blue gelatin with a gummy shark on top. All you need is a little creativity and everyone can chomp like a champ. First grab some snacks, then go grab a spot on the couch! Between Shark Week and all the shark movies coming out, there’s plenty of options to keep guests entertained. Browse online or swim to your local party store to discover all our Shark Party supplies and more!